No two cabinets are built alike. NuAire is demonstrating their commitment to offering the highest build quality available for your safety. A single sheet of Stainless Steel makes up the walls of the cabinet. Watch the video here. My tower has two lights on the fault and the run light, everything I have read tells me that it is mounted incorrectly. I have tried taking it off and checking the post and everything appears ok. I haven't used it in a while as I have been manually injecting due to a technique requirement. Now I need it I don't understand what could have caused this now. Any ideas or tips will be gratefully received. Advise this member. I am looking for the PM procedures for a Beckman J6B centrifuge. Can anyone help? Advise this member. Can anyone please help me to get software for an old Corbett now Qiagen rotor gene 2000? Advise this member. The SpectraMax® i3 Multi-Mode Detection Platform comes with standard spectral absorbance, fluorescence, and luminescence detection. Additionally, user-installable options allow the SpectraMax i3 System to grow with your changing application needs to fulfill and go beyond the standard reader applications, protecting your initial investment. As new assays are developed or your needs change, simply add a cartridge or the SpectraMax® MiniMax™ Imaging Cytometer option as opposed to buying a brand new system. 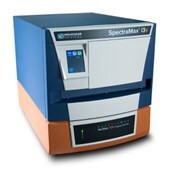 Read more about the SpectraMax i3x on the Molecular Devices website. Stir stick and beaker not included. Distek’s core market includes brand name and generic pharmaceutical drug manufacturers, CRO’s, CMO’s, Nutraceuticals, government agencies, and universities. To ensure consistent quality and to meet the international standards of our world market, Distek has been ISO certified since 2002. Read more. Bio-Rad Laboratories, Inc. (NYSE: BIO and BIOb) today announced the launch of five Droplet Digital™ PCR (ddPCR) Multiplex Mutation Screening Kits for detecting several key actionable cancer mutations and the wild-type allele in a single reaction. The combination of ddPCR and multiplexing technologies increases the throughput of genetic analysis to give clinical researchers more information per patient sample. Read more. BioTek Instruments announces the launch of the Lionheart™ FX Automated Live Cell Imager with Augmented Microscopy™. Lionheart FX is optimized for kinetic live cell imaging, with up to 100x air and oil immersion magnification in a variety of slides, dishes, microplates and flasks. Imaging channels include brightfield, color brightfield, phase contrast and fluorescence, with both image-based and laser autofocus. Read more. Founded in 2006, VORTEX began as a cost-effective local laboratory service provider in the North Carolina area. Today, VORTEX has grown to become a leader and trusted partner in the Dissolution, AR&D, QC and Formulation laboratories of the Pharmaceutical and Dietary Supplement industries across the country. Our highly experienced team is comprised of former dissolution and analytical equipment providers, pharmaceutical chemists and metrology staff who have joined forces to provide an exceptional level knowledge, reliability and dedication to our customer base in the fields of dissolution, analytical and tablet & capsule testing equipment. WFC3 will not start with s1 closure from 600e controller. It will start if disconnected from 600e controller and remote start wires are shorted. Have and older WFC same model and works with 600e pump controller. Tried different controller same result. Advise this member. I am receiving a warning after running the blank - "Detector saturation. Data may not be valid. My instrument is the AAnalyst 200. My duplicate samples which i run for copper, calcium and magnesium are showing that the calcium and magnesium are perfect but the copper is way out. I also have a permanent red glow around the cathode of the copper lamp which was purchased in December 2014. I also have another lamp from September 2013 which has the same permanent red glow. Neither the calcium or magnesium lamp are glowing. I have repeated the procedure again and the copper is miles out but the magnesium and calcium are both perfect. Could this mean that the lamp is broken? Advise this member.